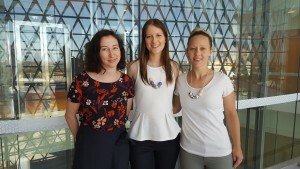 The Centre congratu lates Ms Megan McIntosh (pictured middle) and Ms Holly Evans (pictured right) on each being awarded a Commonwealth Government Research Training Award PhD Scholarship. These are highly competitive scholarships. We also congratulate Megan and Holly who are both recipients of a Freemasons Foundation Centre for Men’s Health PhD Scholarship top-up award. Megan who has a Bachelor of Arts in Psychology (Hons) from the University of Adelaide is returning to the Centre after completing her Honours year (1st class) with the Centre in 2017 under the supervision of Dr Camille Short (pictured left). Camille will remain as her supervisor along with Dr Melissa Opozda from FFCMH and Professor Daniel Galvão (Director of the Exercise Medicine Research Institute at Edith Cowan University WA). Megan’s PhD will be building on her honours work aiming to improve patient-centred support available to men who are on active surveillance for prostate cancer, particularly for those men who have restricted access to services such as those living in rural and remote areas. We welcome Holly to the Centre. Holly has a Bachelor Applied Science (Hons) and a Graduate Diploma in Exercise Physiology from UniSA, and is taking some time away from her role as a Senior Exercise Physiologist at Inform Health and Fitness Solutions in Norwood to complete her PhD. For her project, Holly will exploit her expertise in exercise physiology to develop and deliver individualised internet-based exercise support to men with metastatic prostate cancer. Holly’s supervisors are Dr Camille Short and Professor Daniel Galvão. Both Megan’s and Holly’s projects take advantage of the Centre’s expertise in digital health, rural health, men’s health services preferences, and prostate cancer supportive care. Both Megan and Holly will be part of the NHMRC Centre of Research Excellence in Prostate Cancer Survivorship, of which the Centre is a partner. This entry was posted in News, Research and tagged CRE-PCS, exercise prescription, men's health, PhD, prostate cancer, rural health, scholarship, supportive care. Bookmark the permalink.